Artist and engraver: Manskirsh, J.F. 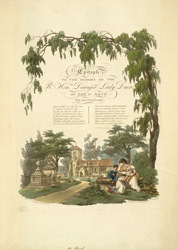 A print showing an epitaph to the memory of Lady Dacre of Lee in Kent. There is a verse lamenting her death, Then below is a view of Lee parish church, some decorative tomb monuments and a sobbing woman with children sitting on a tomb chest. Lady Dacre was the wife of the late Trevor Charles Roper, Baron Dacre, who died in 1794. He had married in 1773, Mary, daughter and heiress of Sir Thomas Fludyer, a knight and alderman of the City of London. They had two seats, one in Belhouse in Essex and another in Lee in Kent.